REPORTER FILE PHOTO | A fierce blizzard was handled by the superb work of the Shelter Island Highway Department. The Shelter Island government is symptomatic of the dysfunction that has overtaken public administration everywhere in America. Despite the 2 percent tax cap imposed by New York State, the Town Board finds itself unable to live within the cap “because certain departments and individuals are making very, very ambitious” requests for new revenue (“Dougherty: Taxes rising in 2014,” October 17). Typical is the request by the library for a 2.7 percent increase on top of last year’s 6.7 percent increase due to “a continued need for expansion of services” (“Library seeks 2.7 percent hike,” September 19). A private company in a competitive environment (otherwise known as capitalism) must manage expenses to the reality of its revenue base or face insolvency. A company that simply raises prices to increase revenues is soon out of business. Government, however, is a monopoly. Elected officials see little need to control expenses because, unlike in private enterprise, they can control revenues by raising fees and taxes. Such officials have no incentive to limit costs because “free” public services are the lifeblood of getting reelected. Benjamin Franklin warned of the danger of a legislature having control over the exchequer. Shelter Island enjoys an added advantage regarding taxation. Several years ago your paper reported that fully 75 percent of tax revenues are paid by second homeowners who are not eligible (permitted) to vote on local matters. “No taxation without representation” was, of course, a rallying cry of the American Revolution. How easy it is to spend other people’s money, particularly when they have no vote. The vitality of the American economy, which has been the wonder of the world for generations, is imperiled by the very governments created to protect it. At the closing meeting of the Shelter Island Country Club, the members were asked to approve the purchase of a new rough mower. Carol Loper interrupted, saying, you don’t have to worry about that — I will donate the funds for the mower. Wow! What a surprise. But this is Shelter Island. Wonderful people are grown here. Later Carol said she loves the Shelter Island Country Club. We love you, Carol. Thank you. I would like to thank our supervisor, James D. Dougherty; our councilmen and our councilwoman; William Enright, Commodore of the Shelter Island Yacht Club; and the Shelter Island Reporter for honoring me for representing Shelter Island on the Board of East End Hospice for the past 15 years. The philosophy of East End Hospice is to bring hope to the dying and their families. By affirming life, hospice helps conclude life with comfort and dignity in a familiar and caring environment. There is a wonderful confidentiality with hospice care to ensure privacy for the patient and his or her family. Since its founding in 1987, East End Hospice has cared for 238 patients on Shelter Island, five of them so far in 2013. It has been most gratifying for me to have served on the Board of East End Hospice and I am still on the committee for the fundraiser we do every other year here on Shelter Island. I also want to thank all the residents of Shelter Island for supporting our fundraising events. We can’t do it without you. Our next party will be on June 7, 2014. Save the date! JULIE LANE PHOTO | Shelter Island Public Library needs taxpayers to dig a little deeper for 2014 to cover increased expenses. 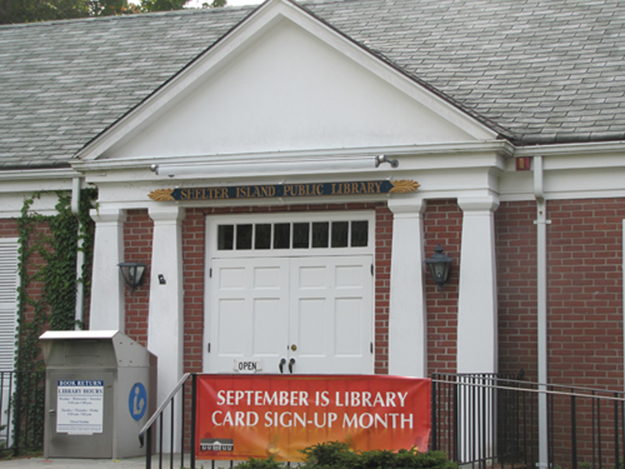 For the second successive year the Shelter Island Public Library will ask voters for a budget that pierces the state’s 2 percent tax cap. This time the tax bite of $540,436 represents a 2.7 percent increase as compared with the 6.7 percent hike that was needed to support the current year’s budget. The library’s board of directors approved the measure allowing the cap to be pierced because in with a cut in grants, contributions and fund raising revenues paired with a continued need for expansion of services, it became necessary to seek more in taxes, said Library Director Denise DiPaolo. The overall budget for 2014 is $630,971 with other revenues coming from contributions, fund raising activities, grants, fines and fees and interest income. The budget is $16,644 higher for 2014 than what will have been spent by the end of the current year. The impact on taxes amounts to an additional $5.38 per household for a median priced property assessed at $702,000, Ms. DiPaolo said. “The financial health of the library is critical to its current success and even more important, key to its ability to stay relevant and useful in the future,” she said. “We’re very creative. We’re very committed. And we’re very frugal,” she said, noting that the library board is “pretty nit picky” in working to cut spending. She praised the board for bringing so much talent to the library in the way of legal advice, marketing and other specialties that save the community money. 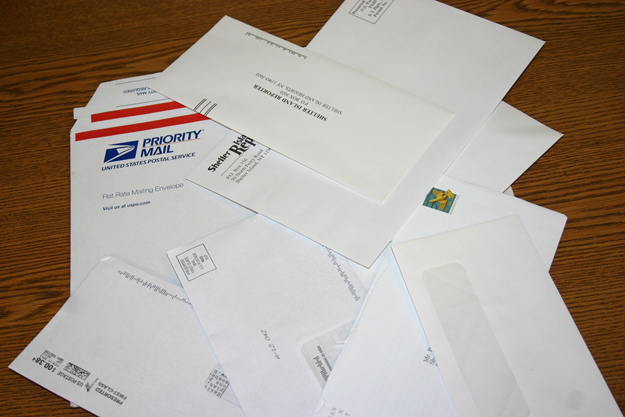 Budget increases, as might be expected, are largely in the areas of utilities and insurance. Fuel oil, electricity and property/liability insurance are expected to increase by $2,305, Ms. DiPaolo said. There’s an increase of the cost of staff salaries and benefits, although much of that is accounted for by a hike in the cost of employee taxes and benefits, according to Library Treasurer William Martens. The overall spending for salaries, taxes and benefits will go from $423,350 to $438,467. Hourly wages, employment taxes, health insurance and retirement benefits will increase by about 3.5 percent for qualified employees, she said. There are three full-time and seven part-time employees, Ms. DiPaolo said. They have consistently shown themselves to be flexible, volunteering to change hours as necessary to accommodate one another’s schedules, she said. How much of a raise the staff will receive won’t be firmly determined until the end of this year. But whatever the percentage, it will be across the board. Since the ribbon cutting in June 2012 on the renovation project that expanded the lower level of the building, the library has been able to increase its hours, Ms. DiPaolo said. At the same time, sharing of resources among area libraries has enabled all libraries to keep a lid on costs. Inter-library loan deliveries have been extended to Saturdays, enabling more weekenders to take advantage of the program. “We have sharing in our blood,” Ms. DiPaolo said. She counts 3,210 library card holders on Shelter Island and 70,199 visits to the library in the year since the new downstairs space was opened. Gone are the days when a library was a silent place for reading and contemplation, she said. Today, it’s a community center hosting many activities beyond reading and research. Looking ahead, Ms. DiPaolo and Mr. Martens said they must start planning for capital improvements so they’re prepared for major expenses that eventually will require things such as a new roof. The board will be discussing creation of a capital fund where small amounts of money can be set aside that provide that larger pool of funds on which to pull to assure the building is properly maintained, they said. The board will hold a public hearing on the budget at 6 p.m. Wednesday, October 16. The vote takes place Saturday, October 26, from 10 a.m. to 4 p.m.